The home improvement retailer was dragged lower by rising concerns about the health of the wider housing market. 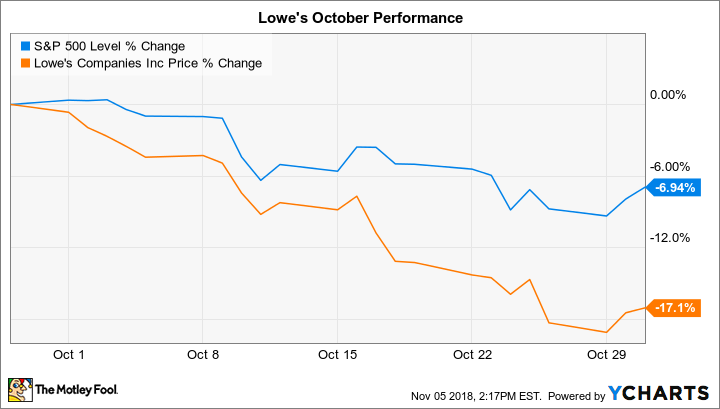 Lowe's (NYSE:LOW) trailed the market last month by falling 17% compared to a 7% slump in the S&P 500, according to data provided by S&P Global Market Intelligence. Shares remain in slightly positive territory for the year, though, up 5% versus a 2% uptick in the broader market. October's dip wasn't spurred by any official news out of the home improvement retailer. Instead, the stock fell in concert with homebuilder stocks, which are under pressure thanks to concerns about a slowing housing industry. Rival Home Depot (NYSE:HD) also declined in what was a generally weak month for equities, and for housing industry stocks in particular. Home Depot will announce its third-quarter results on Nov. 13, and that report will shed some light on how well recent demand trends are holding up under the weight of rising mortgage rates and slowing home sales. Lowe's follows up with its own report on Nov. 20. That announcement will be CEO Marvin Ellison's second report as Lowe's CEO, and the new leader should spend some time discussing his plans to close the performance gap with Home Depot, where he worked as an executive for many years. Ellison's plans so far have called for store closures and a broader reboot of the company's supply chain. Investors will find out in a few weeks whether those moves are helping the company maintain momentum despite wider industry challenges.